This entry was posted in Uncategorized on February 16, 2018 by extramileadmin. Denial is a big part of addiction. When parents have a child who is using drugs, it puts them in an awkward spot. This is particularly true when the child (adult or not) lives at home. It’s very easy to deny your child has a problem. This is especially true when you are being told a lot of lies. This is the common scenario that I see. The Mom or Dad knows their kid has a problem with drugs. The child might sometimes admit it and even ask for help. However, their actions say otherwise. The words might come out, but the behavior doesn’t change. The first reaction might be “tough love”. Something like “I will threaten to kick him or her out”. But then the reality comes in — what if my loved one ends up living on the street and dies? I could never forgive myself. The next thought is “OK, I will let my child stay in my house”. This isn’t good either because I am enabling the behavior. What if they overdose, because I made it too easy to abuse drugs? I could never forgive myself. It is your role to take care of your child. 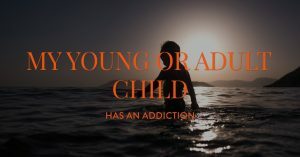 But, when your teen or adult child is addicted to drugs, most likely the best you can do is to guide them to a solution. Willingness is a big part of the recovery process. According to the National Institute on Drug Abuse (NIDA). If your teen or adult child starts behaving differently for no apparent reason––such as acting withdrawn, frequently tired or depressed, or hostile—it could be a sign he or she is developing a drug-related problem. Parents and others may overlook such signs, believing them to be a normal part of the growing-up process. Through scientific advances, we know more than ever before about how drugs work in the brain. We also know that addiction can be successfully treated to help people stop abusing drugs and lead productive lives. Jump in early when you first spot signs of drug use. Why can’t some people stop using drugs on their own? Repeated drug use changes the brain. Brain-imaging studies of people with drug addictions show changes in areas of the brain that are critical for judgment, decision-making, learning, memory and behavior control. Quitting is difficult, even for those who feel ready. If my child refuses to cooperate, should the family conduct an intervention? People of all ages with substance use disorders live in fear of what will happen if their drugs are taken away. You can ensure your loved-one that professional treatment centers will keep them safe and as comfortable as possible – especially if a detoxification process is needed. Be sure to let them know that family and loved ones will stand by and offer loving support. Warning: addicts commonly “change their mind” after a few days of treatment. Parents should pay no attention to this. It is just the disease talking. If you are thinking about doing an intervention, make sure to do some research and plan ahead of time. Preparation is the key to the intervention process. What do I look for in a treatment center for this age group? If you have health insurance, your current policy probably already provides coverage. We can help you with issues like high deductibles. How do we keep things stable in the meanwhile? First, talk to your loved one. There are ways to have a conversation about drugs or other sensitive issues that will prevent a fight. Remember, that drug addicts are very defensive. Consider having the discussion with someone other than yourself. Acknowledge your child’s opinions but know that many people with substance abuse problems are afraid and ashamed and might not tell the truth. This is why you may want to involve a counselor or professional who has experience working with people struggling with substance abuse or addiction issues. If you have a family remember who has successfully recovered from alcoholism or addiction, this is a very good resource. Addicts are much more willing to listen to someone who understands their plight. I have heard that people who use drugs could be “self-medicating” because they feel depressed – How do we handle that problem as well? It is possible your child needs to find treatment for both depression and addiction. This is very common. It is called dual-diagnosis. Sometime you might hear the term “comorbidity” or “co-occurrence”. These terms just indicated that a person has more than one health problem at the same time. Parents should encourage their children to tell all of their health care providers about all of their symptoms and behaviors. There are many non-addictive drugs that can help with depression or other mental health issues. Sometimes doctors do not communicate with each other. So, make sure all relevant healthcare providers know about all of your child’s health issues. Of course, this sounds easier than reality. Afterall, one of the symptoms of addiction is denial. Your child should be treated for all health issues at the same time. If your child ever feels so depressed that you think he or she will hurt themselves there is a hotline you or your child can call. The National Suicide Prevention Lifeline’s number is 1-800-273-TALK (8255.) You are also welcome to call it to discuss your child’s symptoms and get advice on how to best handle the situation. My child’s addiction is making my life unmanageable. What now? Do you have a reason not to trust your child/spouse/friend? Are the savings mysteriously disappearing’? Are the unanswered questions causing hostility and undermining your marriage’? Are you canceling your social functions with vague excuses’? Is concern for your spouse, child or friend causing your headaches, a knotty stomach, anxiety? Is concern for your spouse, child or friend easily irritated by minute matters? Does your life seem a nightmare’? Are the lifestyle and friends of the loved one changing? Do you ever think that they may be using drugs? The hard part is picking up the phone to call. Do it now before you change your mind. If you have answered “YES” to four or more of these questions, give us a call. You are not alone, this is a serious epidemic and the only detox treatment at a hospital is going to produce the results you want. Don’t be embarrassed. this is happening to a lot of other people just like you. It’s just that folks don’t talk about it. That’s why you call us, we understand, we have been through it and we don’t judge. We have seen almost everything. You are not going to shock or scare our team. You will find comfort. Recovery treatment has advanced and it’s no longer true that someone has to hit “rock bottom” to get help. An intervention might be the solution that will start a lifetime of sobriety. You might feel alone, but plenty of other people are going through the same situation. When you talk to someone who understands, it makes you feel much more empowered.